The radiator transfers heat from the coolant to the air, which is sucked in by the radiator fan. Leaks or clogs in the radiator can cause the engine to run hot. 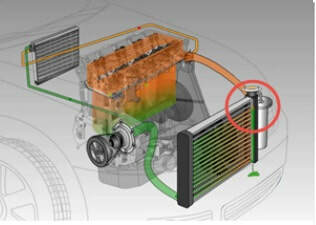 A radiator is a heat transfer device used to remove heat from the engine coolant. It is usually constructed from aluminium with plastic end tanks. 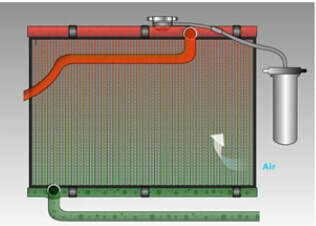 Small tubes run the length of the radiator with small metal fins in between each tube. As air travels over the pipes, either from the vehicle moving or because the radiator fan is pulling air through the radiator, the heat from the coolant is transferred to the air, and the cooled fluid travels back to the engine. Radiators can develop leaks -- either as a result of an object hitting the radiator and puncturing the outside or because the coolant has not been replaced regularly and has become acidic - eating away the metal inside the radiator. Debris floating within the cooling system can also collect in the small tubes, restricting coolant flow through the radiator. This will cause the engine to run hot, especially while climbing long hills or under heavy acceleration. Dirt and debris can also collect within the fins of the radiator, restricting airflow across the radiator. This has a similar result as the small tubes being clogged.